WorldTripping.net - Swaziland travel writing and travel articles. Trips - Cycling Across Africa - Swaziland Journal. We spent the night in our usual upmarket joint. A delightful little border brothel. Our first clue as to the clientelle had been the receptionist's query regarding the number of hours we required. As Simon replied 'all night', I found it difficult to suppress a giggle. We were, of course, shattered. We were led through a maze of rondavels to ours, set a little away from the others. The decor was inspiring, wall and ceiling linoleum and a bright orange, tassled lampshade, swinging precariously above a huge floral covered double bed. Complimentary condoms were on the bedside table, again, a sign that Aids awareness had reached Africa, although the jar of oil based vaseline sitting alongside the pack was disconcerting. The en-suite shower, a hot en-suite shower, was what excited us most, the last eighteen months having mostly been cold bucket washes. We emerged refreshed and ready for a night on the town; fried egg sandwiches and banging Euro-pop. The beautiful rolling hills of Swaziland. Another set of beliefs and customs to learn about and love. We were panicked by the lack of affordable accommodation on our planned route through the game parks. We tried our luck at a lodge anyway. We were not disappointed, a friendly welcome by the South African manager and a massively discounted rate, buffet breakfast included and our own satellite T.V. Despite the overwhelming urge to rest up, we pressed on the following day and reached a small village and local hotel, spending an enjoyable evening chatting with Swazi families and eating, a variation on the usual theme, omelette. Short cycle days followed. A dusty hike past zebra and antelope, followed by a close encounter with the hostel's tame ostrich with a liking for vache kiri and plastic bags, brought us to our rest stop, the camping lawns of Sondzela. I finally managed to persuade Simon to swap his cycle for a horse for a day. Big boned and fleshy Hunter types, impeccably turned out and well mannered. The unmistakeable smell of horse and leather, I felt at home at last. Rubbing noses with muzzles, we made friends with our mounts before climbing aboard and following twisting paths through the park. We were able to pass within touching distance of giraffe and wild boar, watch crocodile and hippo basking in the sunlight unperturbed by our presence. We piled out of the mini bus and began the long walk towards the huge tented area in the distance. Men in sheepskin overcoats and feathered attire thronged us. Children carrying dancing sticks shimmied past. We spotted the young South African couple we had spent time with in Mozambique, now sauntering our way. We all grinned wildly, excited by the carnival atmosphere and our chance meeting. Arranging to link up later, we carrried on, eager to get to the parade ground. The crowd grew and we were carried along the route. As the local population jostled for a place near the large enclosure, we were guided through to the edge by a guard. He smiled sweetly and wanted to know if we'd like to meet the king. Before we could answer, we were swept up by the dancing, stick waving crowd, Simon one side, myself the other. Beautiful, smiling young women and handsome men raised their sticks and turned first one way then another, cracked sticks mid air and then chanted. Sticks were lowered and with bowed heads, we all turned in a circle. 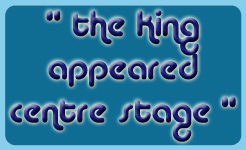 A band marched around the inner ring and a cheer went up as the King appeared centre stage. We repeated the dance, the king and his men doing the same. This was the dance for rain, and a dance for prospective brides to be chosen by a doting male. We'd been told of the controversy surrounding the King's last choice of a young bride and wondered who he would choose this time, there being no limit to the number of wives a Swazi man could have if he had the wealth to accommodate them. The King's last princess had been given her own palace, fated to spend the rest of her days within its walls. The heavens opened and we ran for cover, finding a steaming open sided tent to shelter under. We managed to have a closer look at the elaborate head dress and embroidered costumes the men were wearing and talked of the harvest and of the King's Royal Guard, a privilege bestowed on some of the ex-pats we had already met. Despite being sodden, the mood was upbeat and we left reluctantly, like regular tourists, to catch our coach and be ferried back to the hostel, secretly wishing we had come by bike and were able to go back with one of the Swazi families who had offered us supper and a bed. Before here we were in Mozambique. After here we were in South Africa.